Transportation fuels are energy sources that power various means of transport and include those derived from petroleum, biomass, and synthetic fuels. Transportation fuels are consumed by various modes of transportation i.e. road, rail, air and water. Demand for different types of transportation fuel depends upon the mode of transportation. Diesel and gasoline account for the major share of the overall transportation fuel consumed by road transport. Aviation turbine fuel (ATF) is the most preferable fuel by the aviation industry. Similarly, the railway industry consumes diesel as a primary fuel, followed by electricity. Transportation fuels used across the globe are mainly produced from crude oil refining. Gasoline, diesel, aviation turbine fuels, fuel oil, and bunker fuel are produced from crude oil. Theses fuels account for more than 90% of the total transportation fuel across the globe, reflecting the high level of dependency on crude oil. High emission levels from vehicles running on these fuels coupled with the depleting crude oil reserves has compelled various governments and organizations to develop and promote the use of clean and eco-friendly fuels. Biodiesel, bioethanol, hydrogen, natural gas, and electricity are some of the fuels which have low emission levels. The use of bio-based transportation fuel is increasing across the globe. In the U.S., E10, E15, and E85 are the grades of fuel available for internal combustion engines. These grades contain a certain percentage of bioethanol blended with gasoline. This has resulted in reduced consumption of gasoline and increased the market share of ethanol. Developed regions such as North America and Europe are producing biofuels in high volumes. However, the production of biofuels in large volumes is hampered by the food security of a country as the feedstock for biofuels include palm oil, corn, rapeseed oil, sugar cane, and soybeans. The global transportation fuel market is segmented on the basis of type and geography. The report is further segmented at country level. On the basis of type, the transportation fuel market is further classified into gasoline, diesel, aviation turbine fuel (ATF), and others. Gasoline dominated the global transportation fuel market in 2013. However, the demand for diesel is anticipated to surpass gasoline demand during the forecast period. The consumption of biofuels is anticipated to grow during the forecast period. The number of natural gas vehicles is anticipated to increase during the forecast period. Countries such as India are developing their natural gas infrastructure to promote the use of natural gas vehicles. Brazil has a substantial share of natural gas and biofuels in its energy mix. The country has a large number of flexi-fuel vehicles that run on E85, thus increasing the consumption of ethanol in the country. The Middle East countries such as the UAE and Saudi Arabia are switching to more eco-friendly fuels to reduce GHG emissions from the transportation sector. Increasing population in developing countries such as India and China has increased the sales of passenger cars, boosting the global transportation fuel market. Moreover, industrialization and infrastructure development in developing countries have resulted in increased number of commercial vehicles. This would further boost the consumption of transportation fuel during the forecast period. Improving fuel economy in developed regions is hampering the consumption of transportation fuel in these regions. Key players in the transportation fuel market are integrated companies that are present across the entire value chain. This makes it difficult for a new entrant to enter the market. Additionally, need for high initial investments and a strong distribution network are also acting as barriers for market entry. Some of the global players in the transportation fuel market include Chevron Corporation, ExxonMobil Corporation, Petrobras, Royal Dutch Shell plc, Saudi Arabian Oil Co., Sinopec Limited, Total S.A., and PetroChina Company Limited. The transportation fuel market report by Transparency Market Research provides in-depth analysis of the consumption of transportation fuel globally. The report divides the market on the basis of fuel type and geography. The report analyzes the consumption of global transportation fuel in terms of volume for the 2014–2022 period. The global transportation fuel market has been segmented on the basis of type of fuel and geography, followed by analysis of a few major transportation fuel consuming countries. The market share of various segments in the report reflects the consumption of transportation fuel across the globe. For this research study, the base year is 2013, whereas the forecast is from 2014 to 2022. The report provides a comprehensive competitive landscape and features companies manufacturing transportation fuel. This report includes the key market dynamics affecting the transportation fuel market globally. The analysis in the report provides detailed insights of the global transportation fuel market. Major dynamics such as drivers, opportunities, and restraints of the market were analyzed in detail and are illustrated in the report through tables. The report also provides a detailed industry analysis of the global transportation fuel market with the help of Porter’s Five Forces model. 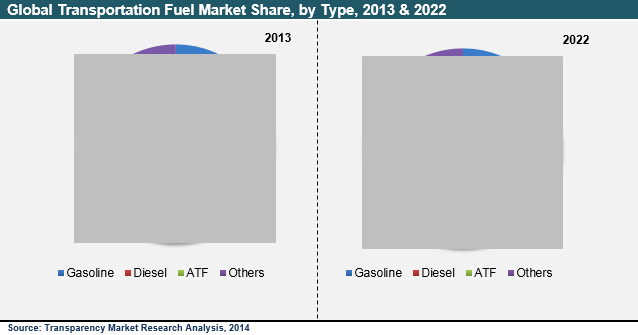 The transportation fuel market has been segmented on the basis of fuel type as gasoline, diesel, aviation turbine fuel (ATF), and others. Gasoline was the largest segment of the transportation fuel market globally, accounting for more than 40% of the global share in 2013. Consumption of gasoline was augmented by a large number of gasoline vehicles across the globe, especially in the U.S. However, the gasoline market is hampered by stringent emission regulations. The environmental regulatory bodies in North America and Europe have set emission targets. In order to achieve these targets, OEMs are improving engine technologies to reduce emissions and enhance fuel economy. This is anticipated to hamper the demand for gasoline during the forecast period. Diesel was the second-largest segment of the transportation fuel market globally, accounting for more than 35% of the overall transportation fuel consumption in 2013. Diesel is majorly consumed by commercial vehicles in developing economies due to increasing industrialization and infrastructure development. The transportation fuel market was analyzed for regions such as North America, Europe, Asia Pacific, and Rest of the World (RoW). Volumetric consumption of a few major countries is also provided for all the regions. Countries mentioned in the report are the U.S., China, Canada, Italy, Japan, India, Brazil, South Africa, the U.K., France, and Germany. North America held the major share of global transportation fuel market, accounting for more than 30% of the global transportation fuel consumption. However, growing population, increasing industrialization and development in Asia Pacific are anticipated to make the region the largest consumer of transportation fuel by 2022. In 2013, China was the major consumer of transportation fuel in Asia Pacific. The consumption of transportation fuel in Europe is growing at a slow rate. RoW is anticipated to be the second-fastest growing market for transportation fuels during the forecast period. Major companies in the transportation fuel market have integrated operations with established distribution channel, acting as barriers for new entrants. Some of the key market participants in the transportation fuel market include Chevron Corporation, BP p.l.c., Royal Dutch Shell plc, ExxonMobil Corporation, Phillips 66, Saudi Arabian Oil Co., and PetroChina Company Limited. The report provides an overview of these companies, followed by their financial details (if available), business strategies, and recent developments.